Having major crapola going on with my computer. blue screen appeared again and then rebooted. the screen appeared several times in trying to reinstall windows, updates and IL2 game. So now when I try to start the game I get the blue screen. to determined what it might be. So there I am, not sure what it will cost with holidays coming up and I am suppose to go back to Maryland for the holidays anyways. So just started and I might have to go back on reserve again. If anyone knows anything different to try please let me know otherwise I got to wait until I can get to the Geek squad at Best buy's to have them take a look. The first thing I do when this kind of thing happens is reseat data cables - both ends, power cables, memory, video card, and the processor and heatsink - cleaning and reapplying the thermal paste between the heatsink and CPU. If the heatsink/ CPU reseating and regreasing is a little much for your computer building skill level, that's the one that's probably ok to skip for now. The rest are pretty straight forward and easy to do. If you're uncomfortable about any of it, try looking for a vid on you tube of how to " remove and replace memory in a PC, or remove and replace a hard drive, etc. Reseating is geek talk for remove and/or disconnect. Then put it back in/ reconnect it. I usually pull things out and put them back in twice because the scraping of the contact points as the two pieces are joined helps to clean the contact points. This part most likely applies to you, but at the same time most likely is not what's causing your blue screens. 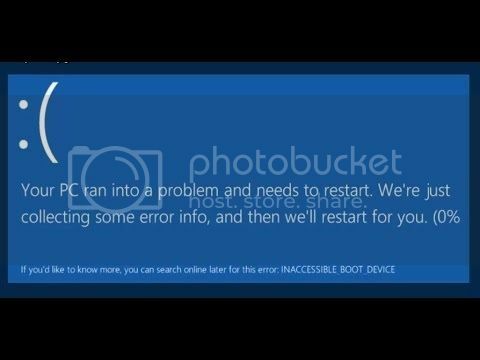 Fix the blue screens, then this next bit might be useful to you. A new windows module is causing a lot of high cpu usage and over spinning of fans. The windows installer module worker( or something very close to that) is the one. I've only seen it run when I'm online. It's part of the windows update. I noticed my fans spinning way up while I was just reading an article online and thought my computer was getting ready to burn up the cpu so I took it apart and reseated the heatsink/cpu and still had high fans speed on and off. Checked task manager when I heard the fan spin up and CPU usage was 60% and higher. Windows installer module worker was the culprit. Looked it up, and yep. It's a fairly common problem that seems to have started about a month or so ago. I've set my updates to not run unless I tell them to. Not as easy as it used to be, but it can be done. It means going in and editing the registry for most people though. Thank you for the great tips BB, I will try anything at this point, I should be able to complete these tasks, Well off to get some heatsink sealant and give it a try. Will update after some completed functions. Update: I have gone ahead and disconnected everything and reconnected. I Have not done the heat sink compound thing yet, going to have a relative come over and help me this week. So far still same issues and fan speed is still erratic. I just re read your first post. I'm not sure which fan is giving you fits or if it's all of em. Your video card probably has the same kind of fan/heatsink deal one the gpu. (graphics processor ) might be able to reove , clean, re apply thermal past/grease/or pad, and reattach to video card. Especially if it's the video card fans going whacky. Might also be a power supply problem. isn't troubleshooting fun? Its Stressful, working on all you mentioned. Yep. The first couple of times it's a little intimidating. Once you've done it a couple of times and the computer comes back on after you've put it back together the stress levels go way down. The way I like to think about it is, if the next step is taking it into a repair place, as long as you don't catch the thing on fire or kick it too hard, you're not going to increase the cost of having to take it in by giving it a go yourself first. The fact that a couple of connectors, or the usual suspect bits aren't connected should make no difference at all to them - as long as you mention it to them when you're dropping it off. Stuff like that usually comes back at their standard minimum charge. Usually one hour bench time. + hardware if needed. It's the data recovery that gets expensive. Hardware break fix is relatively cheap because it really isn't that time consuming when you're all set up to do it. The parts that I always am a little extra careful with are putting the ram sticks back in - I've broken the slot off while pushing down on the memory stick a little too hard - which meant the system board needed to be replaced now. and take some extra time with the whole cpu/heatsink assembly. Want to get the heatsink as squarely seated on the CPU as you can. Tighten the screws/clamps by making just a couple of turns on each screw at a time tightening one just a little, then the one diagonally across a little, etc. That'll help evenly locate the pressure across the entire contact surface of the CPU with the heatsink (where the Thermal paste/grease goes). The other bits that should stress you just a little is the connectors on the wires and data cables. They can be a little fragile. Don't pull on the wire, pull on the connector. A lot of them have a little ridge or indent in them to semi lock them in place when they're connected so they can be a little stubborn coming out. Sometimes a little pressure ( just a little) to one side or another or a gentle rocking motion as you gently pull will help release the little built in locking indent/ridge. cpu fan and heat sink thing, he agrees with you BB, that a lot of times they don't put enough compound on and they over heat. So lets hope, if its not that then its a trip to the Geek Squad. Update: Well it still goes to the blue screen when the system is loaded up. If I try to play the game about 5 mins in here comes the blue screen. And as soon as I start gaming the fans go crazy as well. activity for a while. I have my phone so will keep active on the forums. If need to get a hold of me for anything Jack has my phone number. If you need to put me on short LOA that is fine. Have a great Thanksgiving good people.